Cleveland is one of the great American Foodie destinations. 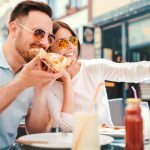 In addition to having many original dishes and having an imposing list of top-rated restaurants of all genres, Cleveland particularly has numerous steakhouses that can compete with any city in the United States. Clevelanders are very fond of steak and do not take it lightly. Every side of town has its favorite places to go for prime rib, t-bones, filets, porterhouse, tomahawk or NY strips (I love prime rib medium to medium rare) so as a nod to the steak lovers in Cleveland, we have assembled the best places to eat steak in Cleveland. If you are an the type that wants to spend $50 or more for your cut or if you are on a budget, The Cleveland Leader is sure to have a place for your financial appetite. 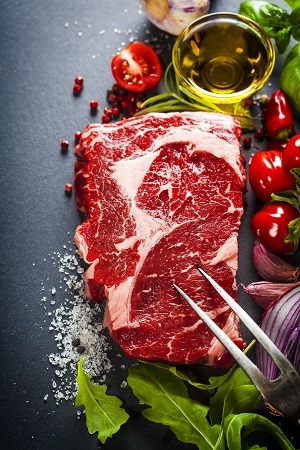 It is our hope that you find a new place to enjoy that first bite of steak and also give your favorite steakhouse its proper due. To see our full list of the best restaurants in Cleveland, click here. 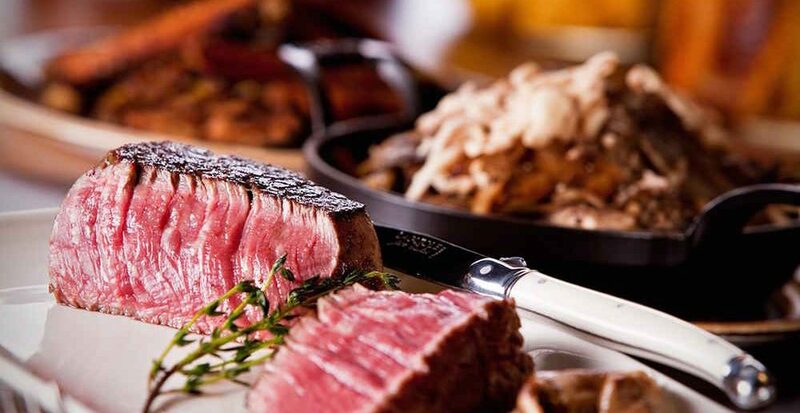 Recently named on of the top ten steakhouses in America, Red has a great reputation for its great food, atmosphere and attention to detail. With Restaurants in Cleveland, Miami Beach, Pittsburgh and Indianapolis, Red is becoming a national name in high quality steaks. If you want a premium experience, Red will not disappoint. Please try the C.A.B. Prime NY Strip and Ribeye. For a special treat, the 40 Day Dry Aged C.A.B. Prime Ribeye is a sure bet. The Raw Bar is a great place to start if you are an oyster lover. The Frutti Di Mare is another fantastic option to get the party started. Known for many years as the premiere steakhouse in Cleveland, Morton’s has been the site of many celebrity gatherings and marquee events. Even though Morton’s is a upscale restaurant, they have many happy hour specials and deals that even the common man can enjoy. Morton’s is an International staple in the world of steakhouses with locations across America, Canada, Mexico, China and Singapore. The Cajun Ribeye, Center Cut prime Ribeye and the Porterhouse are great selections. If you want to feel like you have arrived, The Baked Escargo, Maine Lobster Cocktail and Jumbo Shrimp Alexander will suffice. Another fast growing national steakhouse chain, Hyde Park has been another go to spot for steak enthusiasts. Hyde Park is known for its impressive list of aged steaks and fish if you want a change of pace or have a guest who does not eat red meat. Some of these entrees are the Steak ala Lobster, The Japanese Waygu Strip Loin, Surf-n-Turf and the Steak Au Poivre. The Chilled Shellfish Platter and Oysters on the Half Shell are great starters. One of the most opulent restaurants in Cleveland, Marble Room Steaks and Raw Bar is a visual journey in culinary decadence. From tradition cuts like prime, t bone and NY Strip to Tomahawk, Marble Room also has an extensive seafood and sushi offerings for the upscale diner. With 12 signature cuts that are USDA Prime Midwestern beef, Ruth’s Chris Steakhouse takes their steaks seriously. As one of the nation’s vaunted steakhouse chains, Ruth’s Chris Steakhouse is a bucket list item for Cleveland Steak aficionados. When visiting, be sure to try the Filet, The Cowboy Ribeye, The Porterhouse for Two and the Tomahawk Ribeye. The Chilled Seafood Tower is an excellent selection for an appetizer. Known for its Celebrity guests, XO is one of the city’s most frequented restaurants of any genre. The views you can experience of the best of Cleveland’s landmarks add to the posh environment. Oh yeah the steak is pretty good too. A few to check for are the A-8 Waygu Tomahawk 24 oz Ribeye, The Delmonico, The Bone-In Filet and the A-9 Waygu Strip Steak. Before dinner you may want to go for the Blackened Grouper Tacos, Fried Calamari or the XO Tempura Sushi Roll. In addition to its imposing list of steaks, Cleveland Chop House has a full menu that has contributed to its meteoric rise in the Cleveland restaurant scene. Regardless of the score, Cleveland Chop is packed for every Browns home game for the Browns Brunch. 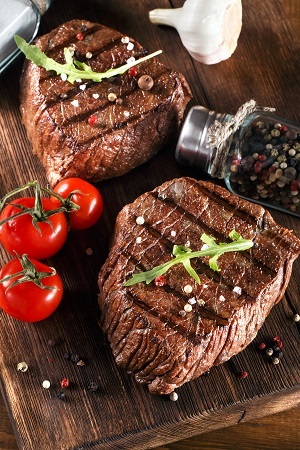 The Boneless Ribeye, Kansas City Strip and Executive Filet are some of the preferred cuts. For Starters the Steak Cigars, Bacon Wrapped Shrimp, Shrimp Bruschetta and the Ahi Poke Tacos have received rave reviews. One of the few Steakhouses in Cleveland that has a focus on Midwest traditions and a commitment to using organic food , wine and beer from local vendors, Urban Farmer is one of the most eclectic and visually stunning establishments is the State of Ohio. Some of the highly recommended cuts are several variations of the NY Strip(14 oz. Creekstone, Kansas Corn Fed, and 12 oz Wagyu Beef from Colorado), Ribeye (24 oz Ohio Proud and 14 oz Pasture One), along with your porterhouse and flat irons. One of the most consistently highly-rated steakhouses in the area, Strip Steakhouse takes patrons down memory lane with its location in Ewers Barn that is situated in Historic Olde Avon Village. In spite of the age of the buildings, the menu is definitely 21st century. Some of the area favorites include The Boilermaker, The Stripper and the Barrel-Cut Filets. For a change of pace, the Bluewater Toothfish and The Drunken Pig will not disappoint. For almost 80 years, Ferris Steakhouse has been a Cleveland favorite and a staple of Rocky River restaurants. Some of the entrees you should try are the Cleveland Strip, the Delmonico, Prime Rib King Cut and the Filet. You can have any steak “Oscar” style for an additional fee. The Signature style egg rolls and the Scallops de Grand Marnier are outstanding appetizers. Family owned and operated, Ferris continues to please several generations of Lakewood and Edgewater Park Area patrons. For over 45 years, Don’s Lighthouse has been one of Cleveland’s top restaurants. The location has a rich history that dates back to 1911 first as Poschke’s Barbecue. These days, people still come out for the steak and seafood. The Filet, Steak Oscar, and C.A.B. Delmonico are some the favorite cuts at Don’s. The Portuguese Seafood Stew, Kobe Meatloaf and Maple Leaf Farms Duck Breast are some other fan favorites. Winner of the 2017 Open Table Diner’s Choice Award and one of The Plain Dealer Top Work Places in 2017, Delmonico’s is one of the top steakhouses in the area. Some of the recommended dishes include the Bone In Cowboy Ribeye, the Double Cut Filet and of course The Delmonico. For starters the Delmonico’s Raw Bar is one of the finest Chilled Seafood Towers in the city. Known for its swank atmosphere and outstanding steak and seafood, Delmonico’s is a perfect location for business or pleasure. Home of the “Bloomin Onion”, Outback is of the nation’s most beloved steakhouses. Some favorites include The Ayers Rock Ny Strip, The Victoria Filet, The Melbourne Porterhouse and the Slow Roasted Prime Rib. The Kookaburro Wings, Volcano Shrimp and Steak Mac and Cheese Bites are some of the appetizers you can start with. You can come here and have a great time for the whole family and not miss your next mortgage payment. If you have a an appetite larger than most, Texas Roadhouse is the place for you. With a long list of hand-cut steaks and southwest decor, Texas Roadhouse is a great choice for steak lovers. The F.t Worth Ribeye, Dallas Filet and NY Strip are the go-to choices for many. The ribs and fried fish are pretty good too. One of the most elegant dining spaces in the city, Capital Grille puts just as much if not more energy into its food as it does its decor and architecture. Only the freshest ingredients and care go into its dry aged steaks and other entrees. A few top picks include the 22 oz Bone-in Ribeye, the Dry-Aged Porterhouse and Strip. One of the best Chef Suggestions is the Bone-In Kona Crusted Dry-Aged NY Strip with Shallot Butter. Known citywide for its excellent Happy Hour and award-winning wine list, Fleming’s has some of the best hand-cut steaks in Cleveland. The Main Filet, Prime NY Strip and Prime Dry-Aged Ribeye are some of the local favorites. Another hang out Cleveland’s A-Listers, Fleming’s service and swank decor is one of the best in the area. One of the most iconic steakhouse chains in America, Benihana’s is the number 1 name in Japanese Steakhouses. Often imitated never duplicated, The dining experience is one of a kind. Some of the iconic entrees are the Hibachi Steak, Teriyaki Steak and the Hibachi Chateaubriand. Add in a lobster tail and shrimp and you are in for a great time. Churrasco cooking at its best, Texas de Brazil blends Brazilian feast style steaks with the hospitality of Texas. Family owned and operated, Texas de Brazil has expanded nationwide as well across the globe with locations in South Korea, Aruba, and Saudi Arabia. Some of the cuts of meat served are Filet Mignon, Braised Beef Ribs, Leg of Lamb, Brazilian Alcatra, Flank Steak and Brazilian Sausage. One of the country’s best known steakhouses, Longhorn has been serving up juicy beef for over 35 years. In addition for excellent cuts like the Outlaw Ribeye, Flo’s Filet and Longhorn Porterhouse, Longhorn is also known for its tasty margaritas and grilled salmon. One of Lake County’s best restaurants, The Cabin’s Cowboy Steak, Prime Rib and Trout are some favorites among its patrons who have supported The Cabin since 1853, which makes it one of the oldest establishments in the city, if not The State of Ohio. For over 80 years, Hellriegel’s has been one of the area’s best place to enjoy a nice cut of steak and fine dining. Some of the favorites include the Filet Maytag and the Prime Rib. Every Week patrons come for the buffet and book private events like wedding, birthday parties and business meetings. One of the area’s top hibachi style restaurants, Fuji stays packed with happy customers who come from all over Lake County for their Asian cuisine that includes hibachi steak, a well-stocked sushi bar and full Asian menu. Since 1994, Austin’s has been giving its patron’s excellence food and service that is inspired by The owner’s great grandfather C.M. Bateman who ran Bateman’s Store and Saloon in Waco, TX in the 1920s . The Cowboy Steak and Austin’s Filet are some of the most requested entrees.